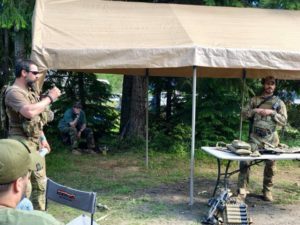 In Easton, Washington State a Beez Combat Systems demo was held at the 2018 Jamboree hosted by Foxtrot. 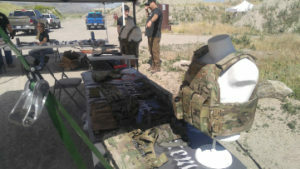 A variety of Beez Combat Systems gear was featured such as the PCC Chest Rig GRID, AR and AK Chest Rig GRID, Combat Belt GRID and a variety of low profile / zero visibility plate carriers. 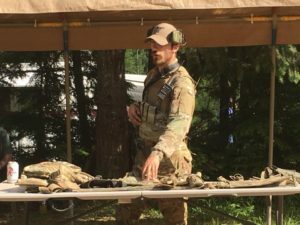 Some of the newest Beez Combat Systems tactical gear featured at the 2018 Jamboree in Easton, Washington was also the Shotgun Scabbard GRID in multicam. 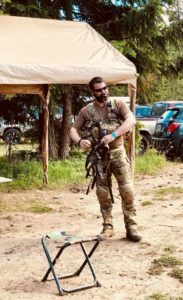 Mike Hull explained his customized personal Beez Combat Systems load out which is a AR Chest Rig GRID in multicam complete with 5 magazines and the upgraded padded harness. Compared to traditional MOLLE webbing, Beez Combat Systems GRID provides more material thus increasing load-bearing strength. 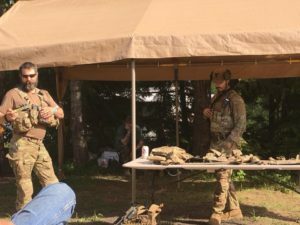 Mike Hull demonstrated the benefits of his load out arranged similar to the gear he deployed with as an Infantry Scout Sniper with the U.S. Army in Mosul, Iraq in 2003. 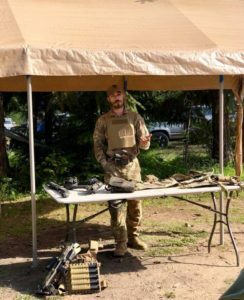 Alden Morris spoke of the benefits and features of the various tactical gear provided by Beez Combat Systems. As seen, Alden Morris is wearing the Beez Combat Systems PCC Chest Rig GRID load-out. 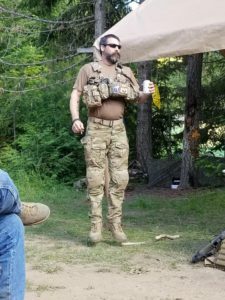 Alden spoke of his personal customized load-out which includes a Beez Combat Systems low profile / zero visibility ECP Plate Carrier underneath his PCC Chest Rig GRID in multicam. The PCC Chest Rig GRID and the ECP Plate Carrier provide low profile concealment comfortably. The low profile plate carriers can be worn underneath any Beez Combat Systems Chest Rig including AR and AK Chest Rig GRID and even maintain comfort when adding the Beez Combat Systems Shotgun Scabbard to your load-out. 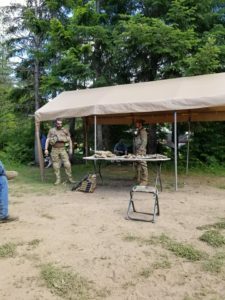 At the 2018 Jamboree one of the most noticed and spoke about benefits of Beez Combat Systems tactical gear was the amount of real estate available for load bearing equipment. The shoulder harness on the PCC Chest Rig GRID is also complete with laser cut webbing so that even HAM radios can be comfortably worn and attach firmly within arms reach. The upgraded padded harness by Beez Combat Systems also comes with additional real estate on the shoulder straps as well as three additional rows complete with Velcro and a drag handle on the rear for combat operations. 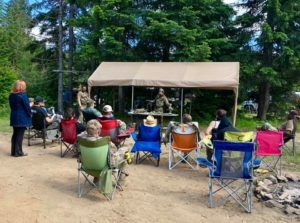 AK Day 2018 was the 5th annual event held at the Big Salty Gun Range by Joe Firearms. Every year it gets bigger and better. This year there were three dedicated bays. The AK gun class bay, the AK shoot bay, and the AK shotgun variant bay. 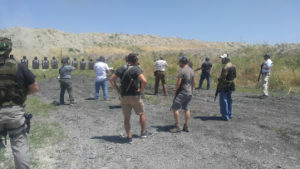 The AK gun bay holds the basic AK familiarization class and runs between 3-4 hours. 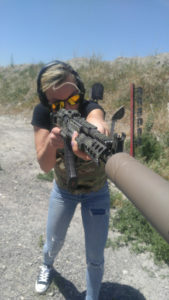 This is a great basic AK class to come and learn more about the AK weapon system. The AK shoot bay provides the shooters the opportunity to try multiple AK47 and 74 built by Joe Firearms. 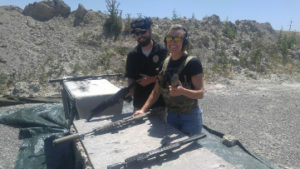 Adam, with Joe Firearms shows off some of the AKs and the MaxFlo Nexgen Defense suppressor. The shooter is wear the Beez Combat Systems AK47 4mag Chest Rig GRID and combat belt GRID. 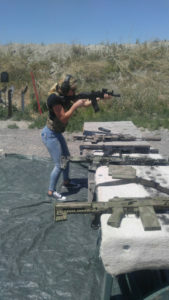 The event is annual and provides access to the best AK weapons, suppressors and tactical gear made here in the Salt Lake Valley.